Have you seen what’s in the mag this week? 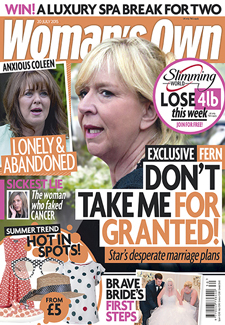 In the mag this week, Fern Britton struggles to save her marriage, we’ve got an EXCLUSIVE interview with Emma Bunton, Kaye Adams talks to us about the trauma of googling herself, Downton’s Jessica Brown Findlay reveals what she’s doing now, and new mum Rebecca Adlington talks to us exclusively following the birth of her little girl! PLUS, remarkable real life stories, discover great value fashion on the high street right now, we celebrate Prince George’s 2nd Birthday, and bring you a holiday hair SOS! Have a slimmer summer with our amazing slimming world diet plan, the best ways to get your five-a-day, and amazing supermarket deals and new foodie finds in our food news section. Pick up this week’s mag for fantastic recipes, more celeb news, money saving tips and more!